In “Tips from a science photographer 2,” Chris explains how to write a photography-based science grant. In this post, he demonstrates how strategic partnership with museums can make a grant proposal more attractive. Check back for “4“: How visually documenting science projects can lead to other photography assignments. 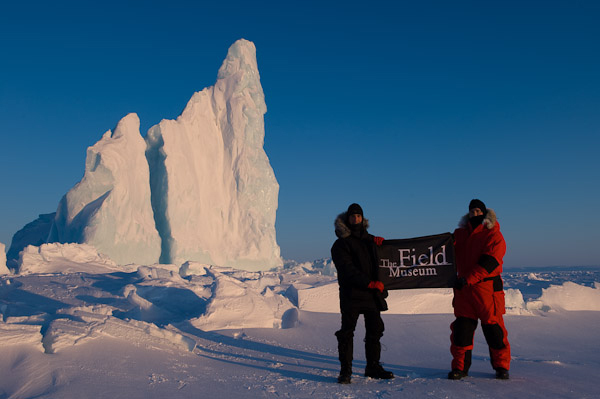 To increase the audience for our “Live from the Poles” proposal, we teamed up with eight science and natural history museums across the country: the Museum of Science, Boston; Liberty Science Center, Jersey City; Carnegie Museum of Natural History, Pittsburgh; the Smithsonian National Museum of Natural History, Washington, DC; the Houston Museum of Natural Science; The Field Museum, Chicago; Birch Aquarium at Scripps, La Jolla, Calif.; and the Pacific Science Center, Seattle. This collaboration has been one of the highlights of the “Live from the Poles project. It’s very symbiotic—the museums deliver kids and adults that are eager to learn about science and we provide the content: cutting-edge polar science, explained in an easy-to-digest format (daily photo essays from the field and live question-and-answer talks via satellite phone). It’s very satisfying to me, as a native Midwesterner, to teach kids in Chicago about polar oceanography through a public program at the Field Museum. In addition to the live talks while we are in the field, museums use my still images for exhibits and slideshow presentations. Working closely with the Field Museum, I created a photography exhibition titled “Exploring the Arctic Seafloor” that is currently touring natural history and science museums across the country (at The Field Museum in Chicago from Feb. 22 to July 6). There’s no question that effective partnerships make you more attractive to proposal reviewers, especially if each partner brings a strong component to the proposed work. Analyze your proposal for weaknesses and then find a partner that specializes in those weak areas. It takes a lot of phone calls, e-mails, and meetings to keep the team organized, but the rewards are substantial. Be Part of the RESOLUTION: Are there other photographers out here who have successful partnership with museums or other educational institutions? How did you initially connect with the institutions and what have the rewards been for both of you? Analyze your proposal for weaknesses and then find a partner that specializes in those weak areas. The one other thing you might want to address is how to make sure your photos fit with the application and explain something about the who, what, where, when, why or how of the project. We wrote about how to do that in terms of text in a post called Every Proposal Needs Six Elements: Who, What, Where, When, Why, and How. The Rest is Mere Commentary. Integrating photos could help strengthen any of those areas, and that might be where the partners you mention come in.